Weather:Weather: sunshine 3/10 Wind: 5 knots NW this am increasing to 5-7 at noon.Visibility was good 30M and water temp was reported at 25C. Dive 1 was conducted at El Funderero off the back deck, down a decent line then line to anchor which placed our dive groups very close to the site. 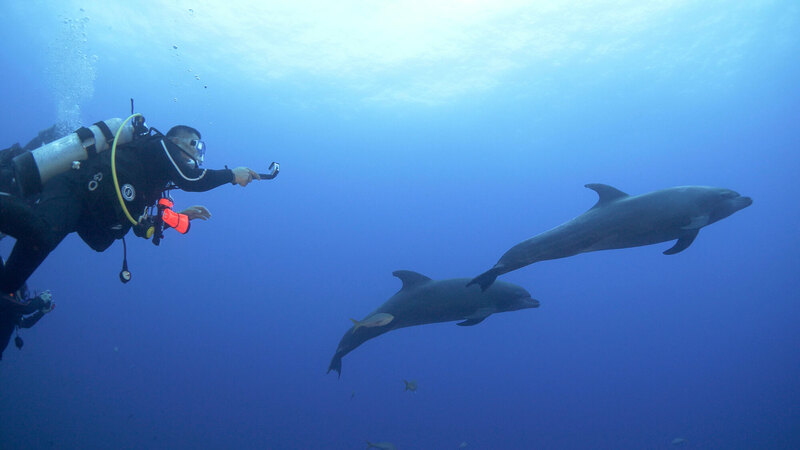 We were fortunate to have pods of interactive dolphins around the boat and divers throughout the dive, as well as large schools of jacks, and rainbow runners. Several silkie sharks were present as well directly beneath the ship, and the dive was finished by a black, and a chevron manta making an appearance. Dive 2 we conducted from skiffs, after a skiff orientation for loading and unloading. Our diver groups were dropped near the canyon and had an animal packed dive with silver tips, galapagos, several hammerheads and three mantas. Visibility was reduced near the cleaning station to about 50′ but the amount of animal life really pleased all the divers, so a great start to the trip.